I found this little guy on the deck rail. Unfortunately, I had just seconds to swing the camera up and snap his picture. I can risk an imperfect photo; optionally, I could have missed the shot and skipped doing it since I couldn’t do it good enough. I took it anyhow. It’s not great, but it is clear enough to see the markings and how unusual he (she?) looked. I only squeezed out three shots and he decided I was being too inquisitive and scooted into a crack to wait me out. This was one was the best. Word for tomorrow – BROTHER. If you prefer to work ahead, see the list for the week under “A Word A Day”. To see how others might interpret today’s randomly selected word, check out other challenge participants in the box at the right. For more information on participating in the challenge, click the tab above. I know. Sometimes we just have to go with good enough. I’m glad you posted it even though I am frightened of spiders. Maybe when I grow up I’ll get over it. I may have taken that picture, but I wasn’t standing too close! Although they are not overly aggressive – I think it would have only bit me if I’d put my hand directly on it. Yea, not me. Don’t want to be over that fear!!! 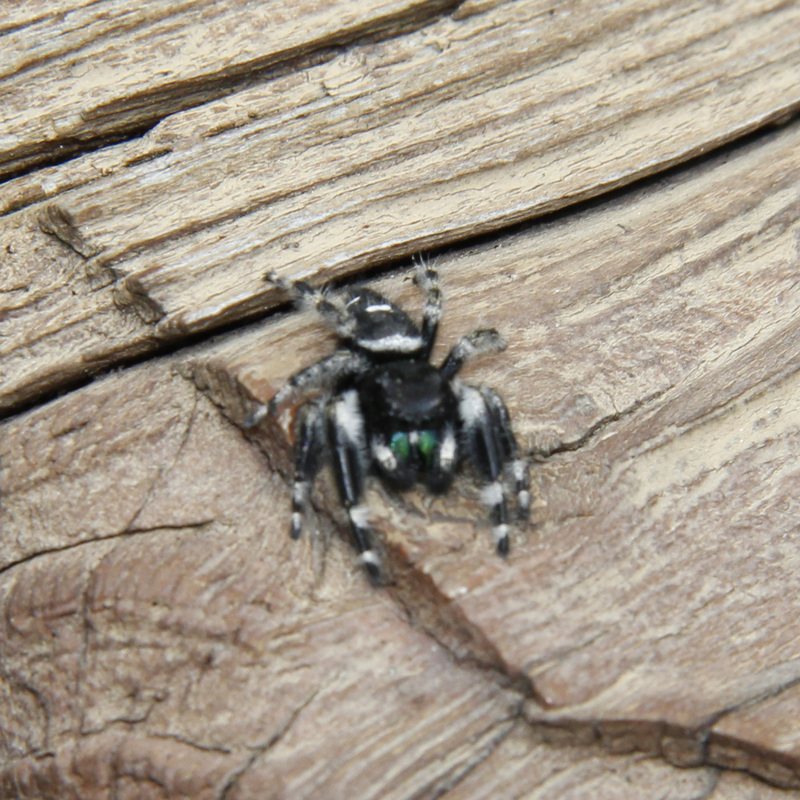 Wolf spider…I think. They jump. Ewww. Brave shot. That’s what telephoto lenses are for – the photographer can’t get too close to such a small object! Especially with those bright green fangs.